When it comes to the art and science of retro gaming, Analogue has no equal. The small company that first brought us the Analogue Nt, then the Nt mini, is back again with the Super Nt – a lovingly engineered and built modern SNES/Super Famicom console. Wait but what? A ‘modern SNES’? What does that entail? 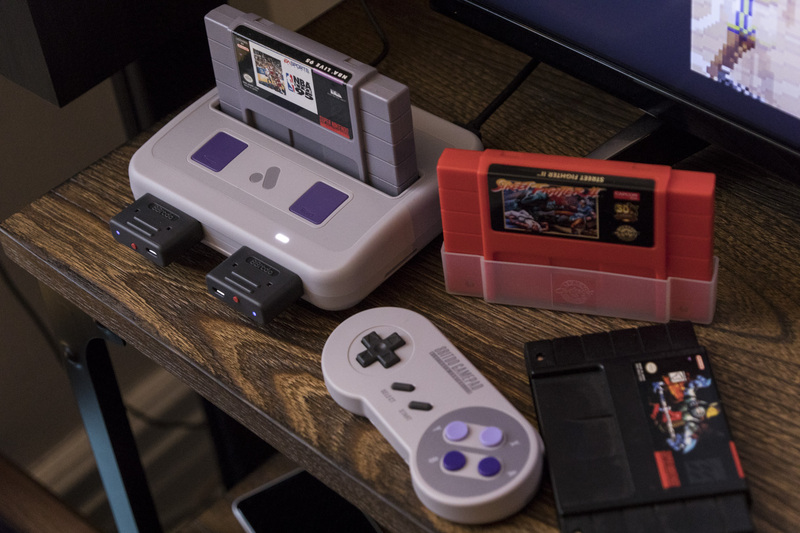 If you know Analogue’s past work, you know it essentially means building a custom FPGA processor that can play actual original SNES and SFC cartridges as they were intended to be played – not using emulation, the typical means these days of recreating classic gaming experiences on modern hardware. Analogue’s approach means no weird emulation bugs, no lag and games that play just like you remember them, but with enhanced 1080p full HD graphics, and terrific color rendering for modern televisions. I tried it on both a 4K HDR 43″ LG LED TV, and on Sony’s latest 65″ Bravia 4K HDR OLED TV, and the resulting picture quality was amazing. As for the game library, it’s as broad as your childhood collection, or as big as the one you can get at your local gaming store or via online sales of old cartridges. Luckily, I have a tall stack of SNES games that has somehow survived multiple moves and general possession culls, so I was ready to roll with NBA Live 95, Zombies Ate My Neighbors, Super Mario World, Super Mario Kart, Killer Instinct, and many more. I also got a chance to play iam8bit’s limited Street Fighter II 30th anniversary edition cartridge re-release, which was amazing. Even if you have no games to hand, you can still enjoy the Super Nt out of the box: Analogue has included a soft copy of both the never-released Super Turrican: Director’s Cut, as well as Super Turrican 2 coded into the console itself. If you love bullet hell shooters, you’ll have a great time with both of these classics, including the Director’s Cut that restores the developer’s original vision of the game without some of the technical limitations placed on the retail original due to shipping requirements and cartridge sizes. The Super Nt comes in a range of colorways, but the retro Super Nintendo inspired version was most appealing to my eye. Analogue also includes an 8bitdo SN30 controller in the box, along with a wireless Retro Receiver adapter for lag-free play. Of course, the console also supports original wired SNES/SFC controllers, if you’d prefer. It connects to your TV via HDMI, and has a number of simulated scanline and other image adjustments you can tweak to make sure the visual output to your TV most closely resembles whatever setup you had growing up playing SNES. There’s an HDMI cable in the box, too. Like Analogue’s other products, this one has a very particular appeal. I hesitate to call it ‘niche,’ however, in part because the team have reduced their pricing from past products and are selling this one for $189.99. It’s also just incredibly fun, and the games have lost none of their charm, so it’s definitely a compelling gaming experience for old and new SNES players alike. Yes, you could pick up an SNES Classic mini from Nintendo (if you can find one) for a lot less, but Analogue’s version is actually a more accurate and faithful reproduction of the original, and it’s built to last, too. If you’re at all inclined to pick one up, I’d do it – it’s those decades of fun you remember, ready to be re-experienced all over again.